Spaghetti al limone, an uncomplicated but gorgeous dish featuring lemon and cream may replace cacio e pepe as your weekday pasta recipe. 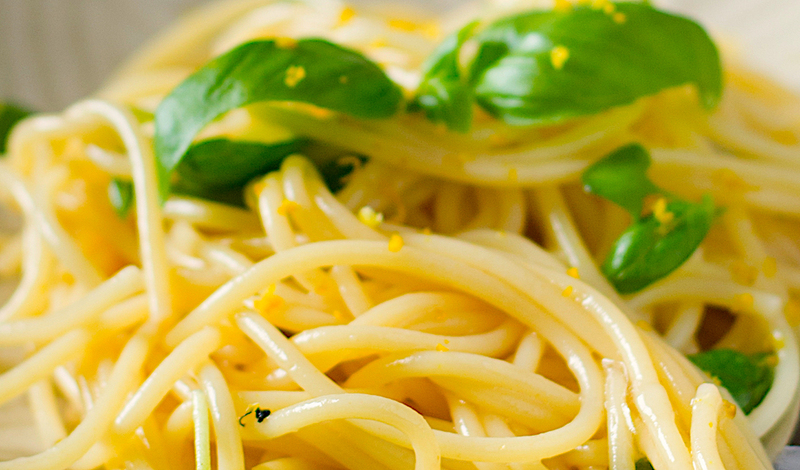 The spaghetti is bright and fruity, light and refreshing. Feel free to drizzle a little extra olive oil before serving. Add spaghetti to a large pot of heavily salted boiling water (at least 2 tbsp salt). Cook until it just wilts (very al dente) stirring to keep strands separate. Over medium heat, add cream to a Dutch oven whisking until liquid is begins to simmer but does not boil. Reduce heat to medium-low. Whisk in both olive oils, 1 tbsp at a time until sauce is creamy and emulsified. Remove from heat. Just before pasta is al dente, reserve 1½ cups pasta cooking liquid. Move to the side. Then add ¾ cup of cooking liquid to the cream sauce. Return Dutch oven to medium heat. Using tongs, transfer spaghetti to sauce (do not drain pasta). Cook in sauce covering spaghetti completely. Then add Parmesan a bit at a time until it melts. If required add more cooking liquid to ensure a creamy sauce. It will become stickier when removed from heat. Stir 1 tbsp lemon balsamic. Add more salt to taste. Place in bowls and season with pepper.